Snowshoeing is a longstanding tradition in Yosemite, and remains an easy, low-impact way to experience the stunning views and jaw-dropping granite geographical features in the park. All 350-odd miles of trails in the park are open to snowshoers during the winter months. The Dodge Ridge Ski Area features numerous campgrounds and dining venues, as well as rental shops and ski lifts. Low-cost downhill and cross country skiing, snowshoeing, and more - right inside Yosemite National Park. A non-profit organization connecting winter sports enthusiasts to outdoor adventure and fun. There are many rental shops in the Yosemite Valley that can outfit you with a great pair of snowshoes. 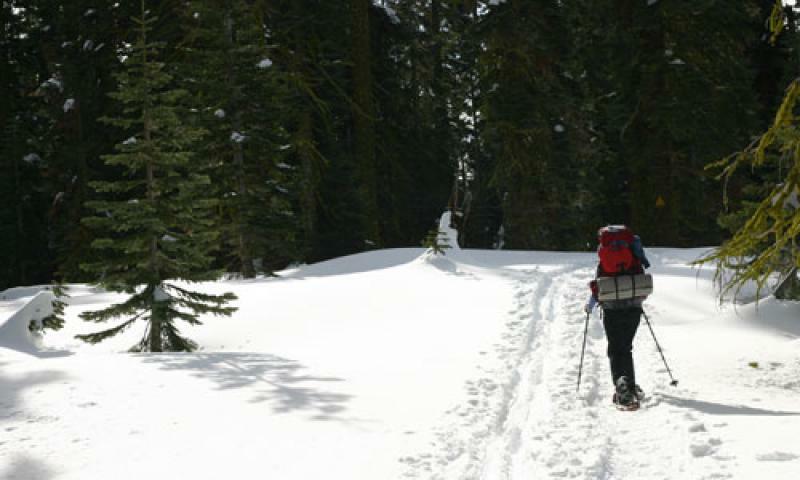 While you are welcome to travel on any Yosemite trail via snowshoe, there are a few especially popular routes in the area. Snowshoers will discover more than 90 miles of trails stemming from the Bridger Pass Ski Area base area. This groomed track is also a popular cross-country route, so be aware of destroying the track. You can reach the Glacier Pass Trail from Badger Pass to view memorable vistas of Half Dome and the Clark Range. You'll find another eight snowshoe trails in the Crane Flat area of Yosemite, one of which ascends to an incredible 360-degree view of the park. For the geologically or historically curious, enjoy a 2-hour, National Park Service-led naturalist trip. A similar trip is available at night during the full moon each month. Come discover Yosemite on foot!